The middle one who looks like a girl isn't so cute anymore. I don't like his skinny jeans. And that thing around his neck is very Rod Stewart. SECOND UPDATE: I feel bad now for saying he's no longer cute. Even if it were true (which it isn't), it's not a very nice thing to say. 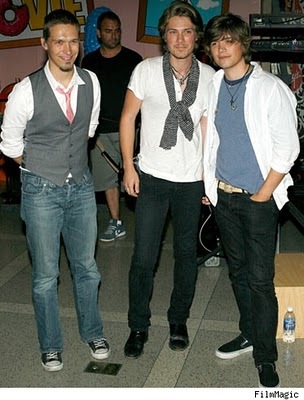 The Hanson boys are good people. They could've turned into annoying boozehounds/druggies like many-a-child stars have, but they didn't. All they wanna do is sing. With each other. They seem to have good family values. I'm going to support them.